40 miles from Bell Tower. Easy 8 miles, round trip. If you’d like to bag the highest peak in Desolation Wilderness from the easiest direction, or just enjoy one of the easiest trails into the Wilderness, this trail is for you! Lyons Trail follows Lyons Creek up to Lake Sylvia from Wright’s Lake Road with a gradual ascent that makes it uniquely easy for higher elevation trails of the Crystal Basin. Popular on weekends, great for its variety of wildflowers in Spring, and with the easiest way to approach the 9980’ Pyramid Peak, this trail has a lot to offer. Directions: Go east on Highway 50 for 36 miles to turn L onto the Wright’s Lake Road, Go 4 miles and find the trailhead on the R with a small parking lot just in from the main Road. Day use permits for the Desolation Wilderness are usually available at the Kiosk at the trailhead, but if you wish to stay overnight you must obtain a wilderness permit from the Pacific Ranger District, (Mill Run Road off Hwy 50, 17 miles east of Placerville on Left). The trail is well used and thus easy to follow to either Lake Sylvia or Lyons Lake but does climb moderately as you approach either lake. Along the way the trail finds some nice granite slides with small swimming holes not far inside the Wilderness area, good place to camp if you stay back from the creek sides to protect its fragile environment. To access Pyramid Peak you must go cross-country before you reach Lake Sylvia. A faint route leaves the main trail along the right side, not far past the granite water slide area. The way is steep and climbs a huge area of broken rock as you approach the peak. The peak is obvious and there are many ways to get there. Super views make the struggle well worth the effort. 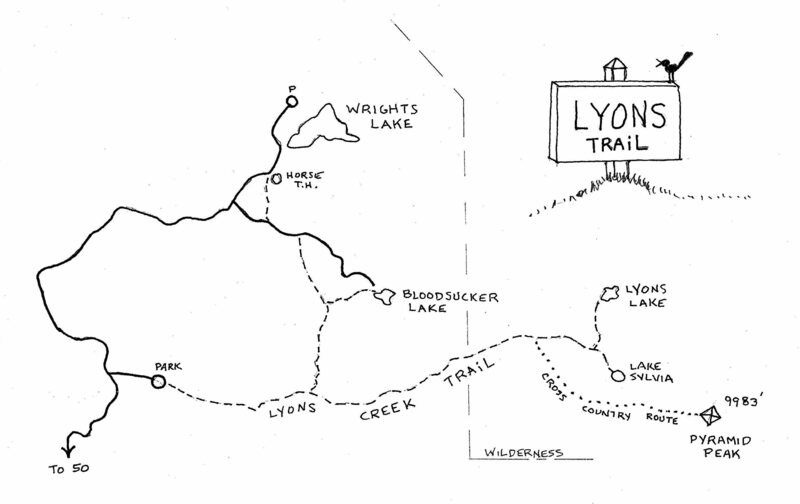 History: Lyons was the name of yet another dairy located near the turnoff to Bloodsucker Lake. That trail is a very old trail that once connected the Lyon’s Dairy to Bert Wright’s ranch up north near Wrights Lake. A well used Indian trail followed Silver Creek through the Wilson ranch and down towards Placerville.